I fall more and more in love with Tasmania each time I visit. This year I have been lucky enough to be in Tasmania during deep winter (here) and have the snow fall on my excited little face and then return to watch the land change and flowers bloom through Spring. 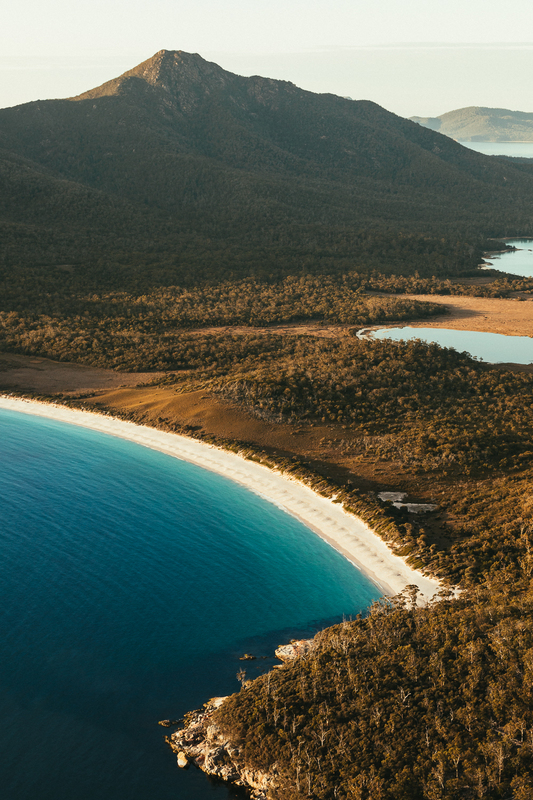 My October begun with a slice of pure magic, as I hit the road for a Spring Campaign in the North East, to discover the 200+ km of pristine coastline with Tasmania Tourism and my friend Matt. Straight off the back of 6 flights home from India and as jet-lagged as you can imagine I found myself (rubbing my eyes) on my first morning back in Australia atop Mt Amos starting at what has to be my most loved vista in all of Australia - Wineglass Bay, Freycinet National Park. As the sun rose, I was reminded exactly what it is I love about being outdoors and how grateful I am my job can take me to these incredible places. It’s definitely always worth that 2:30am alarm clock, scramble and hike to the summit. Nothing beats that feeling, or that view. I was cold, excited and blissfully in awe of the bare jagged peaks of the Hazards rising from a sea of azure water and shimmering white sand below me. “Feet on the ground, head in the sky.” – some of my favourite lyrics, and perfectly summarising how it felt to breathe in the cleanest air and wild hinterland on top of Mt Amos. I could literally stare at this view forever. And thankfully that wasn’t the only time I got to set my sights on the stunning Wineglass bay. 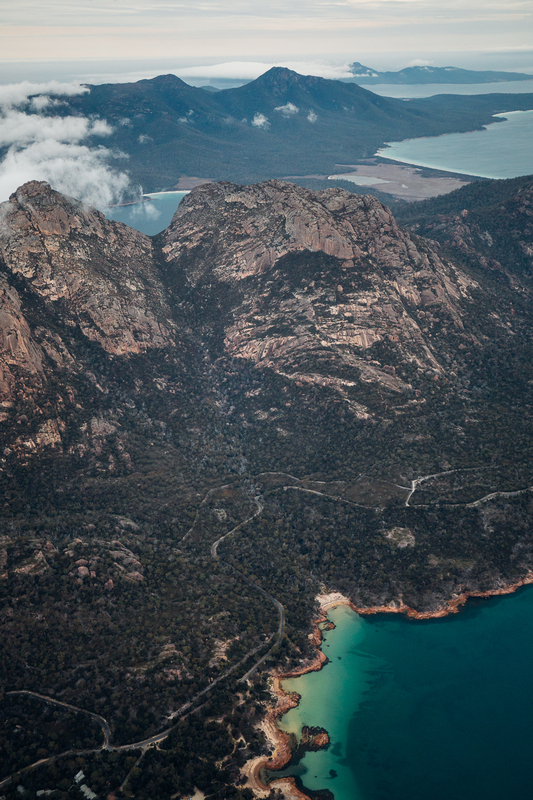 The Hazards look good from every single angle, but arguably the best way to see Freycinet National park is by air. Tasmania can be moody, and I love that about mother nature down there, so the next day when we were greeted with a thick grey low cloud I was amazed how incredibly blue the water still sparkled. By the afternoon we took to the sky with Freycinet Air and one of the best pilots - Sam - in his plane, Taylor. ‘Speechless’ comes to mind when trying to describe the feeling of doing laps around the Hazards, feeling the cold Spring air lick my face as I hung half out the plane with my camera and stared into the depths below. This visit to Tasmania was only short (4 nights to be exact) but we did A LOT. 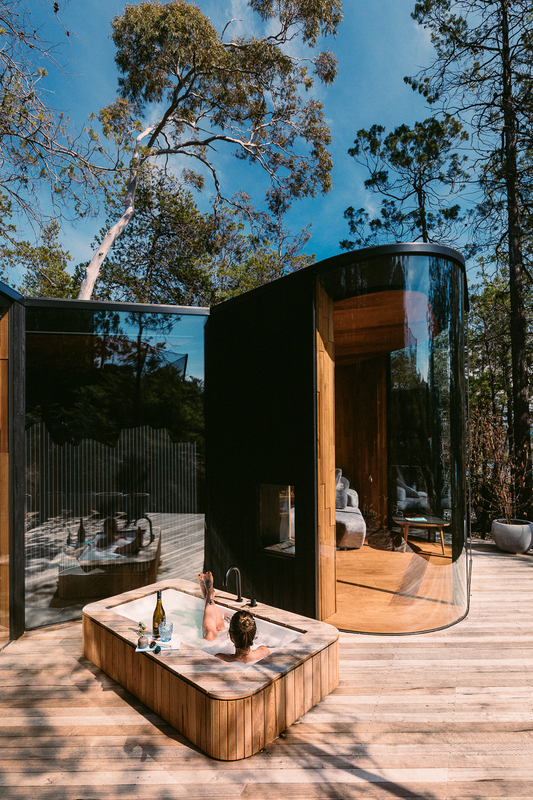 In between there was the quiet moments and Freycinet Lodge was the perfect place to rest for the first two nights before moving on further North East. 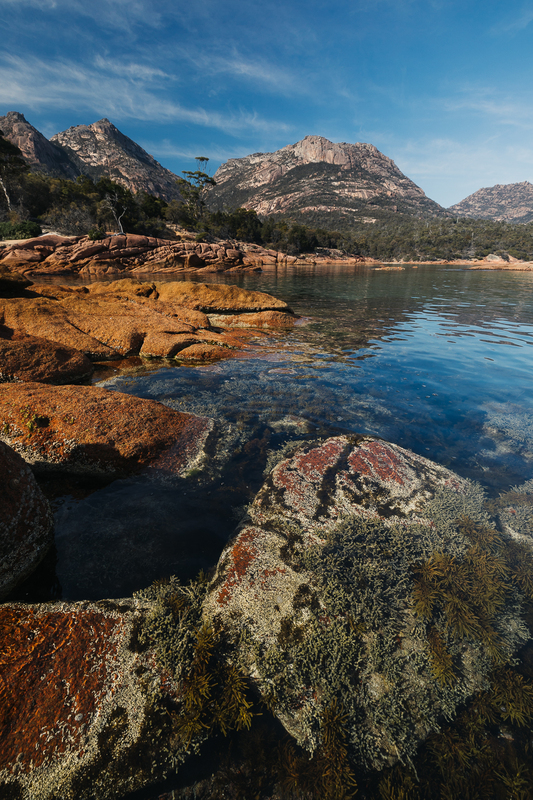 Renowned for its crystal-clear waters, strikingly white, squeaky sandy beaches and orange lichen-covered granite boulders, the Bay of Fires is somewhere I’ve dreamt of visiting for a very long time and it definitely didn’t disappoint. Salty skin and sandy feet are the life for me and so I happily frolicked along the shores of the clearest of clear waters and watched dolphins play in the waves. Quickly becoming obsessed with a little area called “Sloop Reef” – a perfectly situated seaside camp ground, decent cove surf break and those familiar feelings of being small in this giant natural playground. We had a base for the night at The Bay of Fires Bush Retreat and can I please digress that it is some of the best vegan food I have ever had. I love travelling with Matt because not only is he such an incredible talented landscape photographer who inspires and sparks a different side of my creativity, but we have many long conversations of compassion over vegan food. Neither of us could wait for breakfast and we had only begun the starter of our dinner. 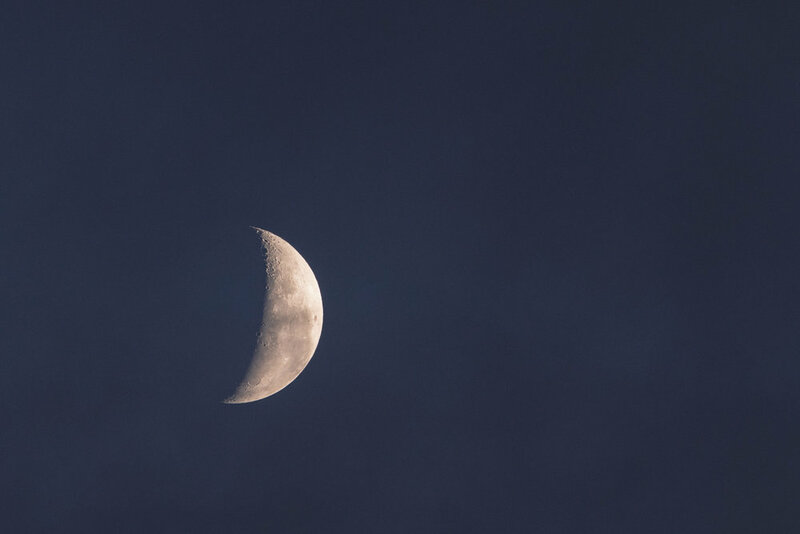 Does a night under the stars, in a bell tent by a fire with a glass of red sound good to you? Then this bush retreat is your place! I knew before leaving that I wanted to return with a group of my friends for a weekend escape – that and I need to see more of the unbelievable Bay of Fires. We were on the move again for our last 24 hours in Tassie. 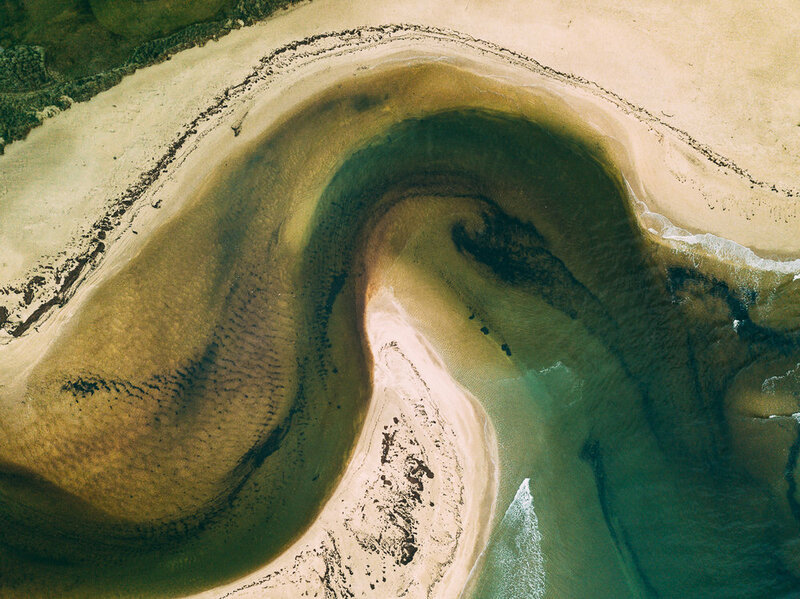 Flying out of Launceston meant we hugged the coast and took the scenic route back via Barnbougle, staying overnight on the Barnbougle Golf Course. From Google Earth we found some sand dunes (surrounded by the beach and the greens) and we literally ran around like children, exclaiming how stunning the dramatic afternoon light was on top of the endless dunes. No visit to Tasmania, particularly flying out of Launceston, is complete without a stop off at the infamous Liffey Falls. So, we made a little detour for a last-minute nature fix to reignite the senses before making the journey home. I’ve had this feeling for a long time, that one day I would like to be able to call it home. Who knows what the future will bring. For now, I’m enjoying the spontaneity of the ride. Thank you, as always, Tasmania.